Crab apple trees are quite uncommon in the wild. It is always difficult to distinguish them from the domesticated apple, due to cross-breeding. The development of the domesticated apple began at the end of the Stone Age. This has lead to a great many varieties available to us today. Bats use old crab apple tree as daytime accommodation. 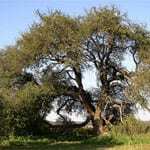 It also provides food for many insects and small animals. 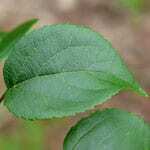 Leaves are alternate with a crooked and pointed tip. They vary in shape from round to oval. The underside of the leaves are smooth but can also be hairy, but not so much as the cultivated trees. The flowers are white and might be tinged with pink. They appear in April and May, having 5 petals. 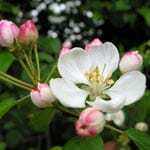 Crab apple flowers cannot be self-pollinated (by flowers from the same tree). It is nessessary to have another crab apple tree that can provide the pollen. This is carried from tree to tree by bees and other insects. Crab apple fruits are very small and normally green, ripening to yellow. They are less than 3.5cm in diameter and have a long stalk. 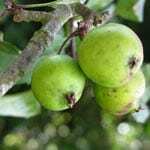 It is by the fruit that you can best identify a crab apple – in fact, they are almost like cherries in shape and size. They are very sour to the taste. 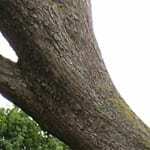 The bark is greyish and rough. As the tree grows and the trunk expands, fissures or cracks appear in the bark. Despite this the timber is very water resistant. In fact, part of the foundations of Venice are built from this timber. Crab apple seems to be a relict of our old oak woodlands. 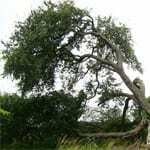 It is a specialist tree that needs a soil rich in nutrients and that contains lime (alkaline). The tree needs to grow in a bright, but sheltered place. It prefers damp areas on the edge of woodlands. Nowadays it more commonly grows in hedges, woodland edges and on riverbanks.